The Liberia Diabetes Center has released a scaring statistics that threatens the country's population. 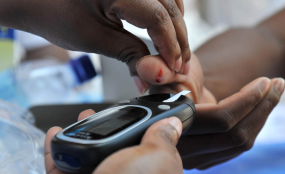 The center disclosed that three million Liberians are diabetics or pre-diabetics. Liberia has a population of over four million people. Pre-diabetes is a condition that comes before diabetes. It means your blood glucose levels are higher than normal but not high enough to be call diabetes. Diabetes can lead to other serious health problems like heart disease and stroke, kidney problems, nerve damage and blindness. Frequent urination, being very thirsty, Tingling, pain, or numbness in the hands or blurry vision are symptoms of diabetes. Liberia Diabetes Center Chief Executive Officers (CEO) James Momoh, said the numbers are staggering and called on Liberians to visit the center, situated on Front Street for free testing. According to him, 500 persons who recently visited the center were tested positive for diabetes. "This is very serious. Every five persons tested here are diabetics. People need to pay attention and know their blood level," he said. Mr. Momoh indicated that diabetes is on the raise and said when people know their status they are better positioned to control their blood level. He said diabetes has no boundary and noted that the best way to control the disease is to know your status. Momoh disclosed that the Liberia Diabetes Center, which is not a clinic, also helps people to know their weight because it is associated with diabetes. "Individuals, who were losing their sights and manhood are now recovering due to free vitamins being provided them by the Liberia Diabetes Center," Momoh disclosed. Momoh, who just returned from the United States of America, said the center is at the verge of entering an agreement with an international group to provide free medication for individuals who would be tested positive for diabetes.